Eternity rings are becoming increasingly more and more popular, and for good reason. An eternity ring is more than just a ring. An eternity ring symbolizes something. It symbolizes eternity. It symbolizes everlasting love. It tells someone that you love them forever. If the diamonds go all the way around, then it symbolizes how your love is a continuous circle that never ends. When you give an eternity ring, you really are saying how much you cherish someone and it is like a promise that you will always feel the same way about them. Eternity rings are so popular because the recipients will remember how you feel each and every time that they look at their beautiful eternity ring. Some people believe that each stone symbolizes something about their relationship. Come up with something romantic that each stone represents when you give the eternity ring. One could be for the day you met. The next can represent your first kiss. One diamond can represent you falling in love. One can be for your wedding day. The next one or more can represent each of your children. If you do not have children yet, or if you just want to make a statement about your life ahead, you can leave some stones to represent your future that has not happened yet. Then, as you make your memories together you can name the next stone to symbolize its importance to you as a couple. Eternity rings make great gifts for many occasions. The birth of a child can really spark a flood of new emotions and mark a special time in a couple's life. An eternity ring can represent this new life that you are embarking on together. Eternity rings make very beautiful wedding bands. Eternity rings compliment almost every engagement ring. The timeless beauty and simplicity of the eternity ring will ensure that you never grow tired of the style of your eternity ring. 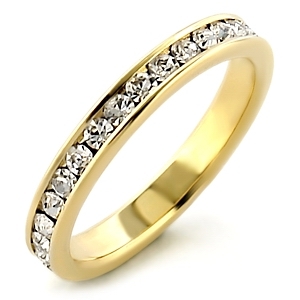 The sparkle and beauty of an eternity ring far surpasses that of traditional wedding bands. There are two types of eternity rings to choose from. Full eternity rings have diamonds (or other stones) that go all the way around. These are very beautiful rings with the maximum amount of sparkle. They sometimes cost a little more than half eternity rings because they have to be custom fitted. You can not buy a full eternity ring and have it sized later, because of the stones going all the way around. Some people prefer the full eternity rings because they symbolize the eternal circle of love that they have for the recipient. Half eternity rings have the stones only on top of the ring. Having exposed precious metal on the bottom of the ring makes it possible to have it sized. Another benefit of the half eternity ring is that you can put bigger stones in it. This makes for a more dazzling display of diamonds (or other stones). Some believe that half eternity rings are slightly more comfortable, but jewellers keep comfort in mind when designing both types of eternity rings, so feel free to pick the one that you are drawn to. Keep all of these things in mind when selecting the eternity ring that is right for your special someone. You are sure to have a special moment in the giving of your eternity ring, followed by a lifetime of love and memories.